Description: Japanese CD reissue of a rare jazz album! Includes three super-rare bonus tracks! Pianist Al Haig has a special place in the hearts of many Japanese jazz fans. His style is undoubtedly based on bebop and Bud Powell, but he could make the piano sing with good tone, and there is sophistication, melodiousness, and depth to his playing. 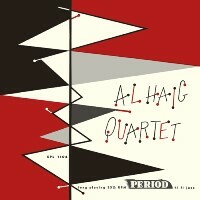 Al Haig Quartet is an early recording of Haig's. Recorded in 1954 in New York, it was produced by Leonard Feather and released by a minor jazz label called Period. The piano-guitar-bass-drums quartet performs well-known standards. Added to this oritinal album are three super-rare tracks. They were recorded in 1952 for Pacific Jazz, but Haig clashed with producer Richard Bock and took the lacquer masters back to New York. The lacquer masters were preserved even after Haig's death, and more than sixty years later, they are now restored and included in this CD. Recorded on September 14, 1954 in New York (Tracks 1-9); September 6, 1952 in Los Angeles (Tracks 10-12). Mono. Originally released by Period in 1955. This reissue CD released in Japan by SSJ Records in 2015.